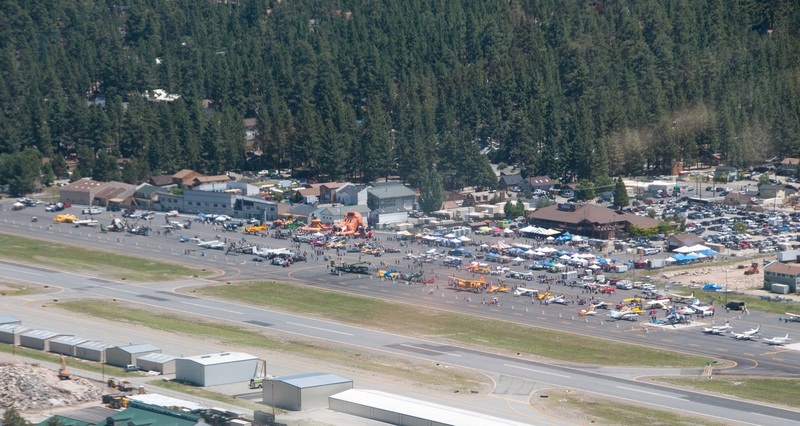 On August 6, 2011, Big Bear Airport hosted its bi-annual air fair. Started in 1984, the Big Bear Air Fair is a combination of community a vendor fair, warbird and vintage aircraft static display, and general aviation fly in. An aerial view of the 2011 Air Fair from the backseat of Rich Piccirilli’s Cessna 172. Big Bear Airport is located in the San Bernardino National Forest 25 miles northeast of San Bernardino, California. 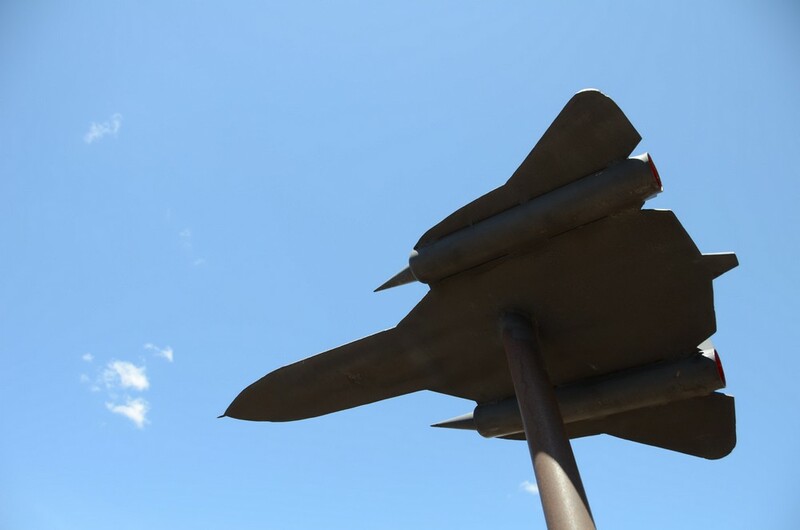 The airport has a 5,850 foot runway and operates under an “uncontrolled approach” in terms of air traffic control. 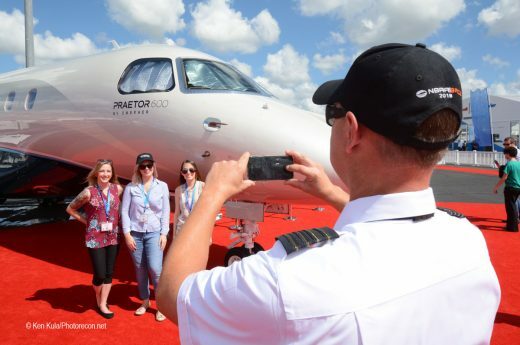 This year’s Air Fair included a static display of 30 aircraft. 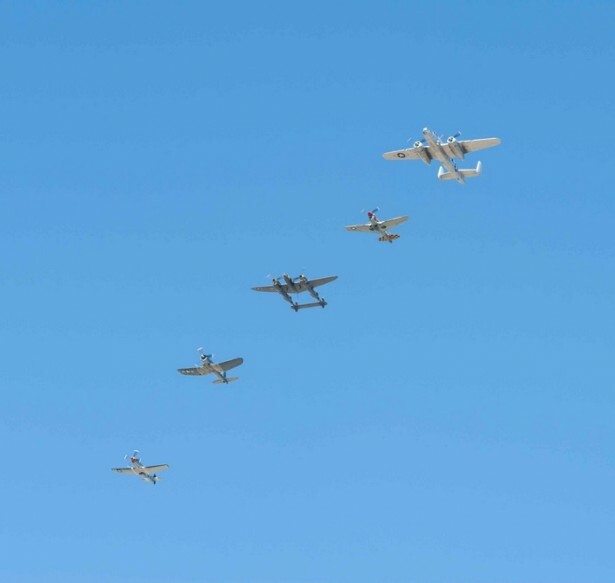 These aircraft included a United States Navy MM-60R Seahawk from HSM-41 based at Naval Air Station North Island, a United States Marine Corps UC-12 from Marine Corps Air Station Yuma, Arizona, several homebuilt planes, the Russian bi-plane Antonov AN-2 from the Commemorative Air Force 3rd Pursuit Squadron based at Cable Airport, Upland, California, a handful of other miscellaneous warbirds, a fixed wing Cessna from the California Highway Patrol and five warbirds from the Planes of Fame Air Museum based in Chino, California. 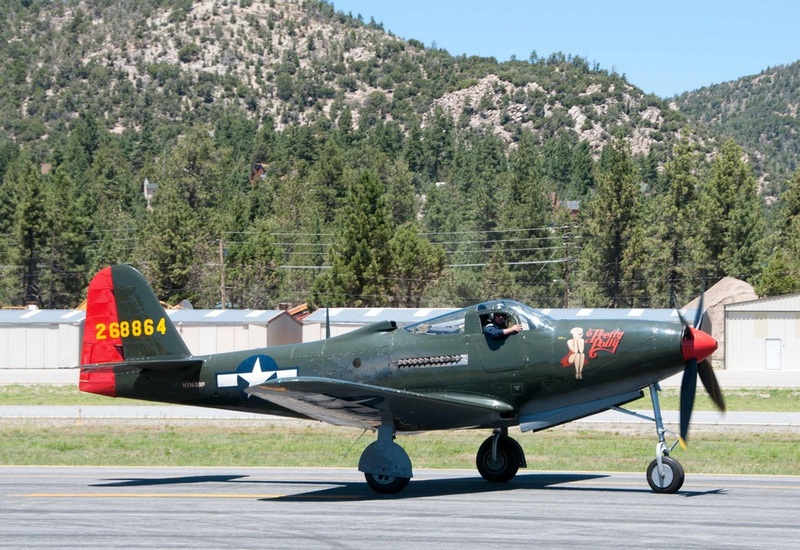 Will Whiteside flying the P-63 Kingcobra “Pretty Polly” taxies to the ramp. Will is also an air racing pilot who fly’s the modified P-51 “Voodoo” and the Yak-3U “Steadfast.” He will be racing at next month’s National Championship Air Races in Reno, Nevada. Another Air Fair attendee, an A-1 Skyraider, touches down at Big Bear Airport. 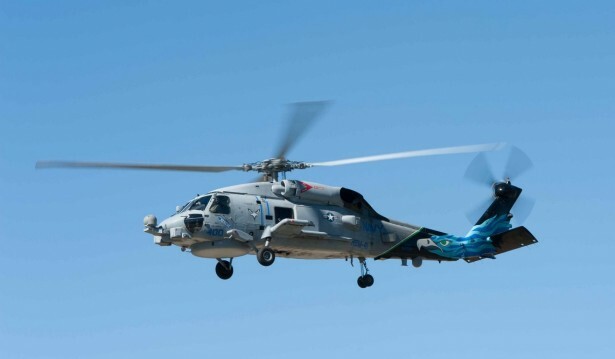 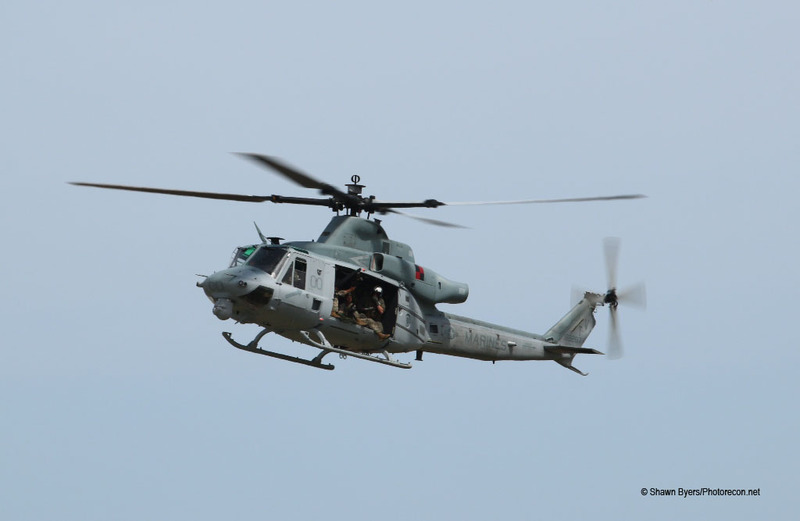 A HSM-41 MM-60R Seahawk from Naval Air Station North Island arrives. Note the custom paint on the aircraft. 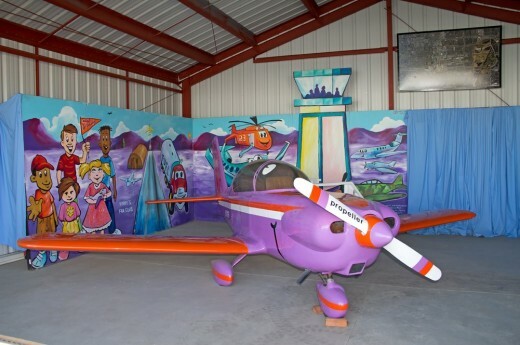 This aircraft was painted by Shayne Meder. 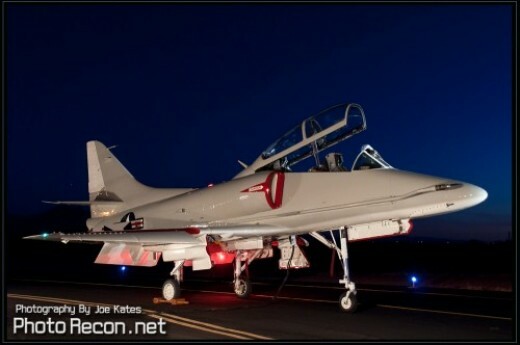 John “Flipper” Flippen arrives in style in his Beechcraft T-34 Mentor. The boys from Chino (Planes of Fame Air Museum, Chino, CA) arrive in a 5 ship formation. 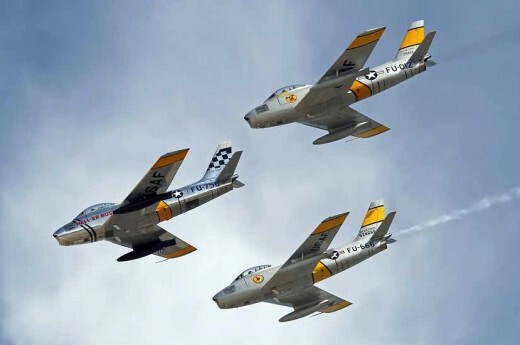 From top to bottom is the B-25 Mitchell, the P-40 Warhawk, the P-38 Lightning, the F4U Corsair, and the P-51 Mustang. 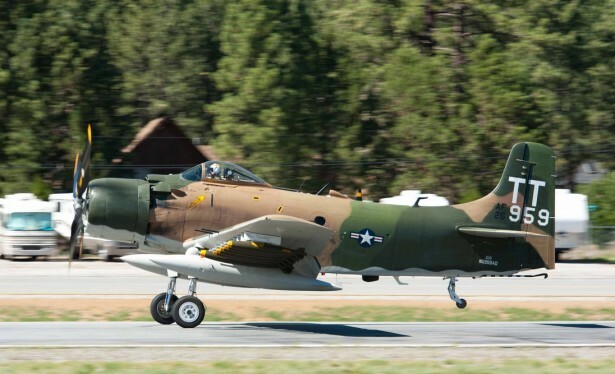 The A-1 Skyraider (front and folding its wings) and T-28 Trojan taxi to the ramp after arriving. According to Gwaltney, this air fair would not have been possible without support of local volunteers (many from the Big Bear Pilot’s Association), the local Civil Air Patrol and nine members of the Big Bear airport staff. 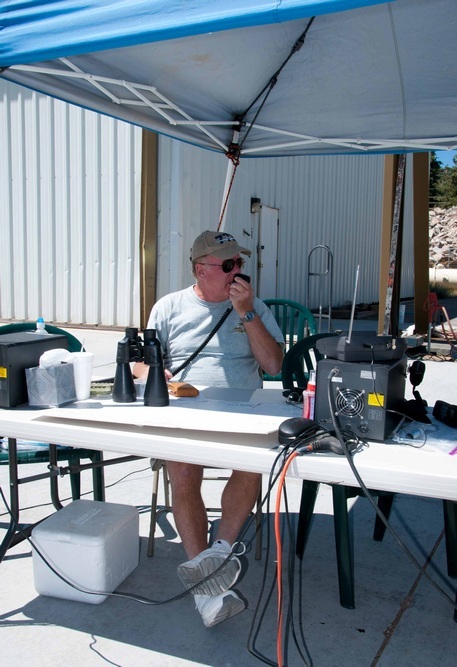 Additional support staff includes the “Air Boss.” Big Bear Airport is an “uncontrolled approach” (meaning there is no dedicated air traffic controller and pilots are responsible for communicating their aircraft’s position during approach, landing, and/or take off). 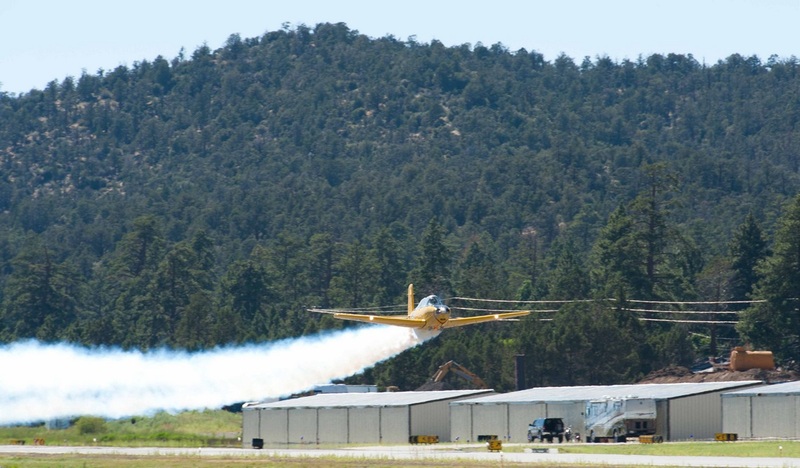 Due to the increased air activity, and to serve as an added layer of safety for the air fair, Gwaltney brought in veteran pilot Peter Murray to serve as a temporary air traffic controller. 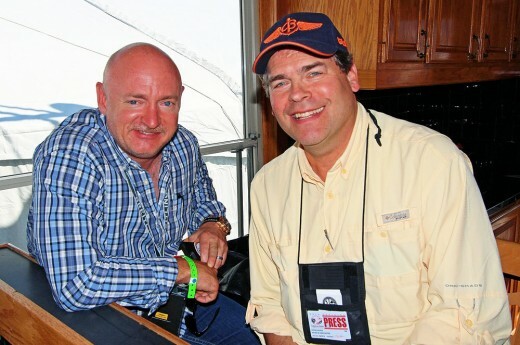 Murray is a retired Naval aviator of 10 years and an American Airlines pilot for 35 years. 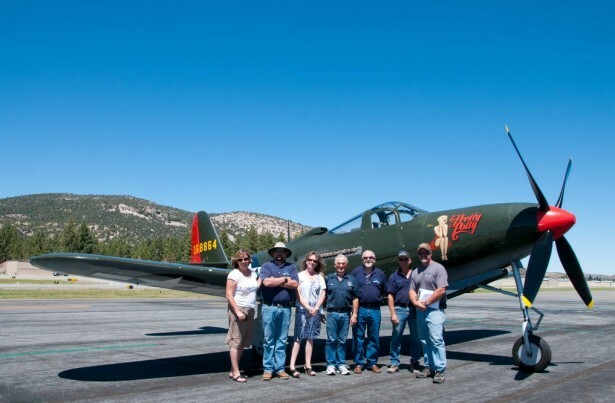 The Big Bear Airport staff that made Air Fair possible (from left to right) Cindy Chundak, Ryan Goss, Nancy Jones, Bob Dow, Pete Gwaltney, Charlie Koch, and Tom Hoover. 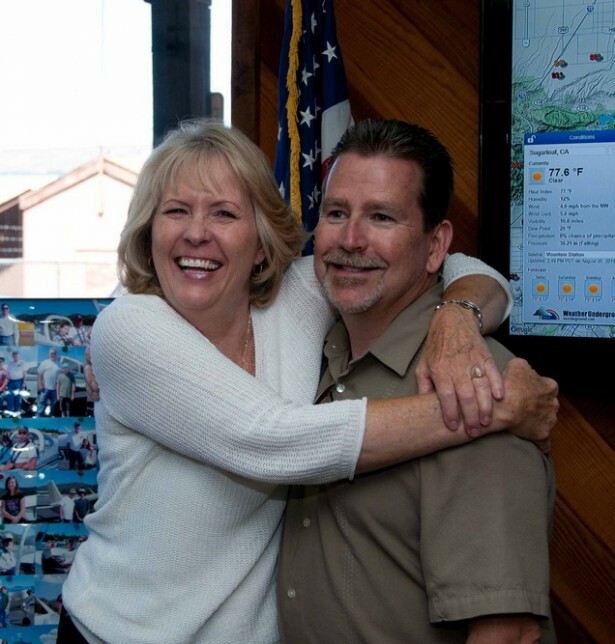 Two additional Big Bear Airport staff that help make the Air Fair possible - Billy Chundak and Diane Cartwright. 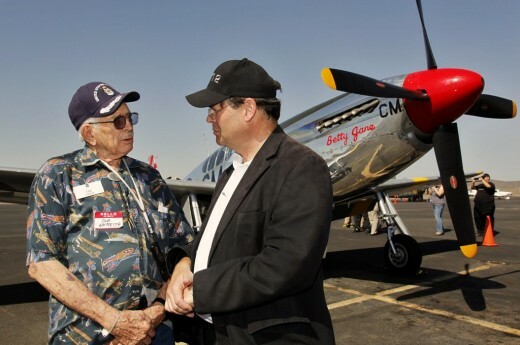 Air Boss “Peter Murray” talks to a pilot before landing. 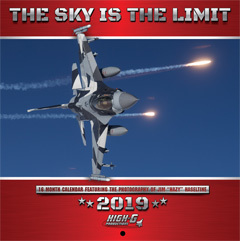 Because it is an air fair, there are no scheduled flying acts other than the “Just in Time Skydivers” (www.justintimeskydivers.com), Boeing Stearman Biplane rides, and those pilots flying in for the event. The air fair started at 7:00am with a Kiwanis pancake breakfast, followed by the opening ceremonies at 9:00am. Just in Time Skydivers – Top row (left to right) Bruce Hofer, Mike Swan, Lynn Fogleman, and Doug Lanphere. 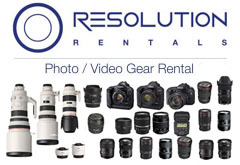 Bottom row (left to right) Rich Piccirilli, Dennis Sattler, Abraham Villamueva. 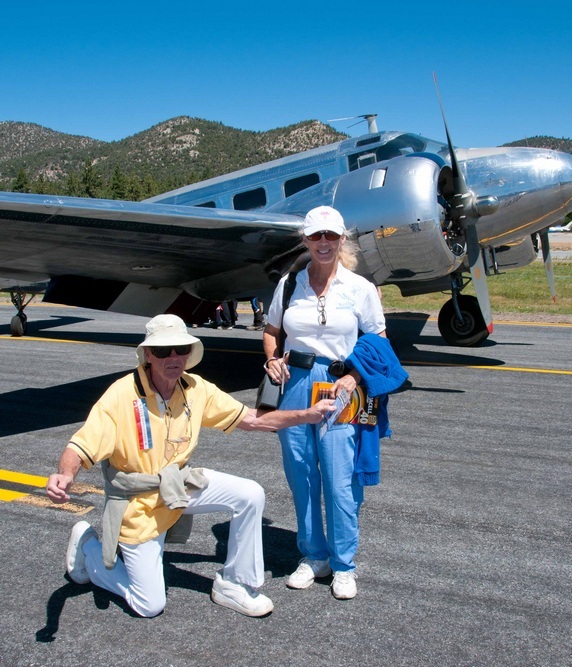 Just in Time Skydivers announcer Bob Jones (a parachutist since 1967) and Peggy Querry (skydiver and pilot). At 12:00, there was a parachute jump by the “Just in Time Skydivers.” This parachute group was formed in 1967 and is based in Lake Elsinore, California. 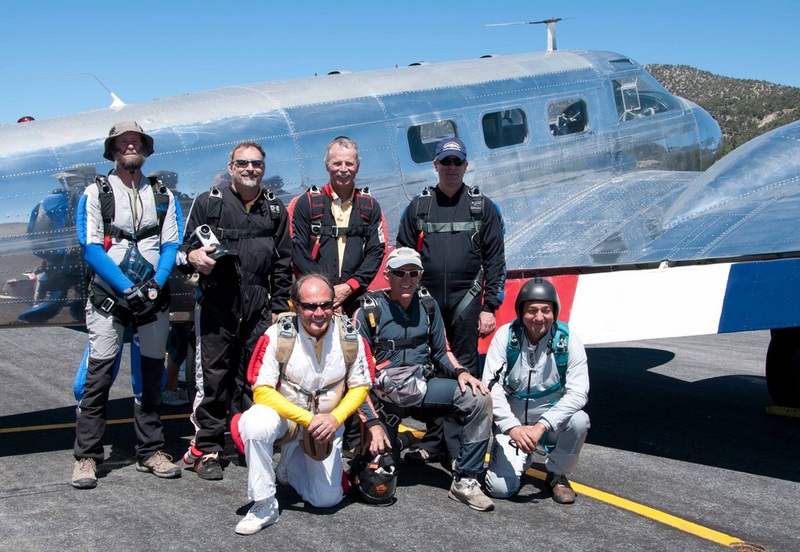 The seven parachutists today have 250 years of combined parachuting experience and 28,850 jumps collectively. 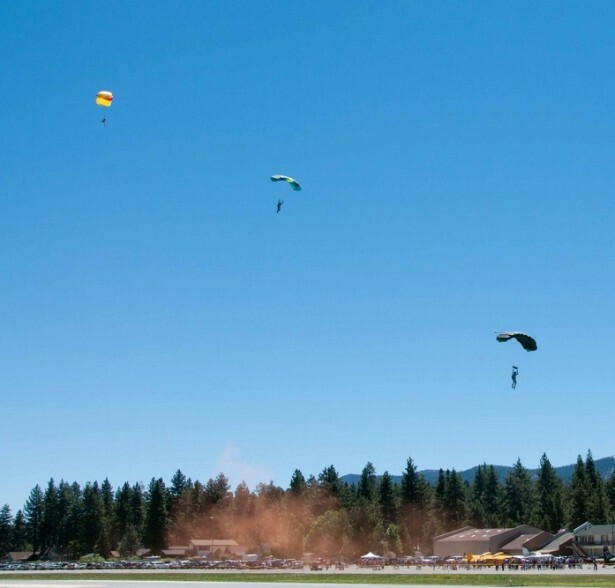 The “Just in Time Skydivers” are under the leadership of Rich Picilli, a skydiver for 44 years with 4,300 jumps. 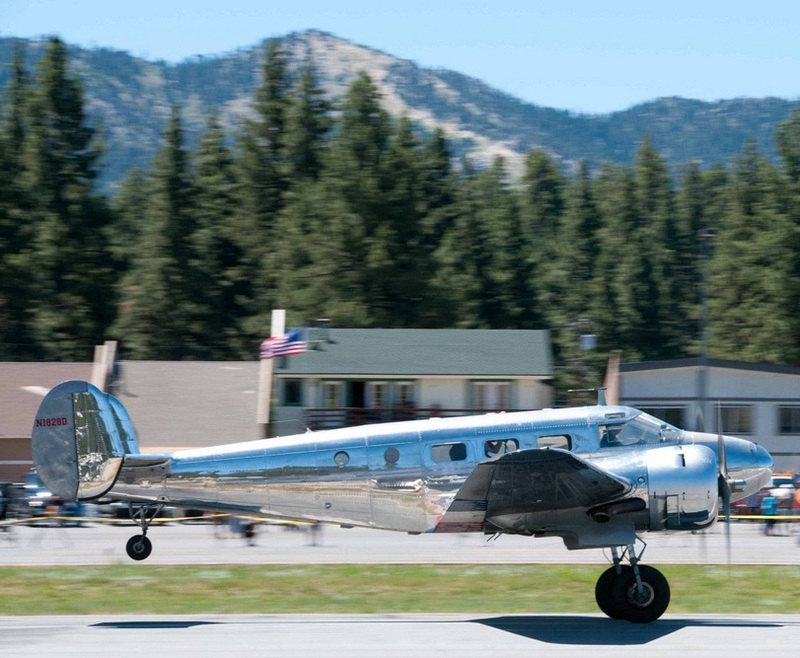 The Beechcraft D-18 takes off with Just in Time Skydivers onboard. 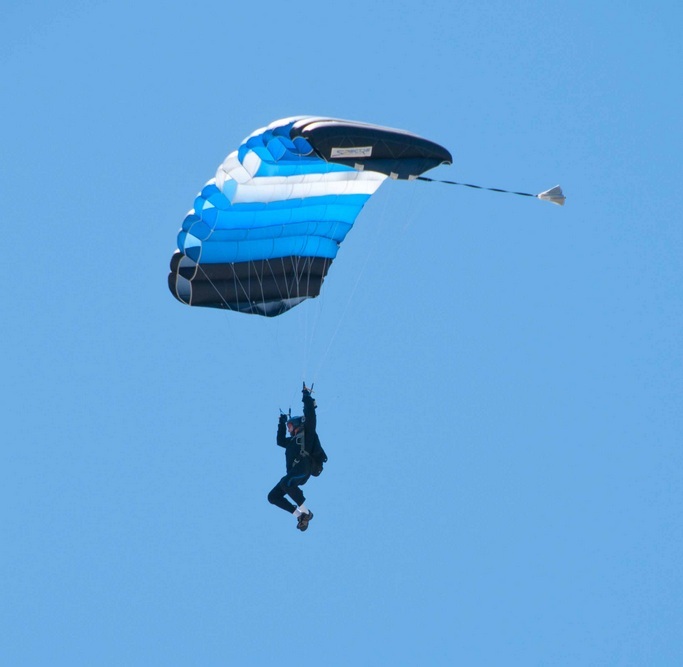 Parachutist Doug Lanphere looks for his landing zone. 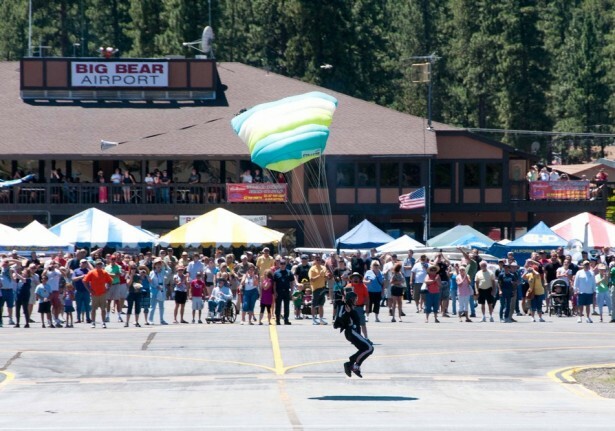 Just in Time Skydiver Mike Swan lands in front of the Air Fair crowd (note smoke canister on his right ankle). Parachutist stacked up 3 deep as they approach their landing zone. 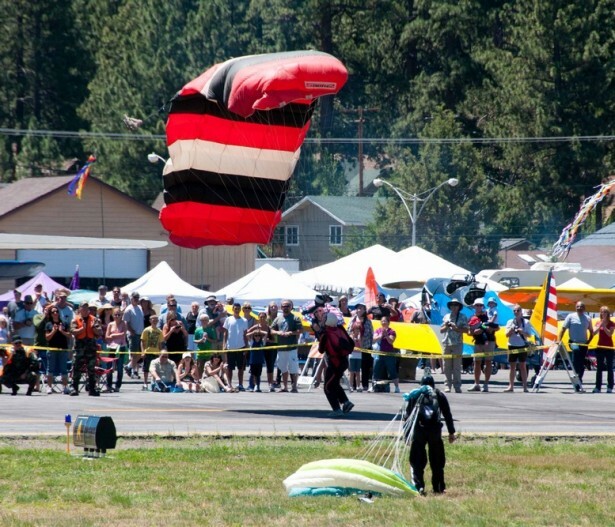 Lynn Fogleman (red parachute) controls his parachute after touchdown (Mike Swan in the foreground). 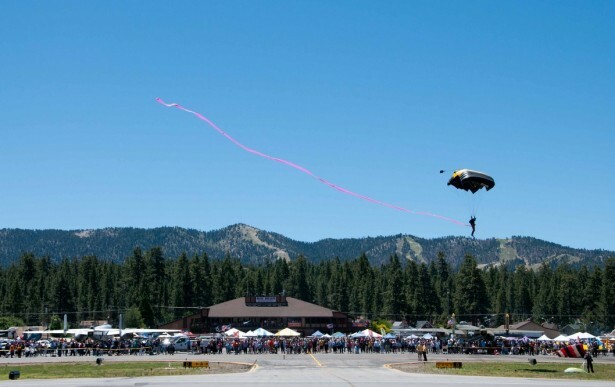 A Just in Time Skydiver lands in front of a full crowd with a colorful streamer. From the time the gates opened at 7:00am until well past 4:00pm, Kent Thomas and his Boeing Stearman from Palm Springs, California, sold rides in his vintage 1940s era aircraft. 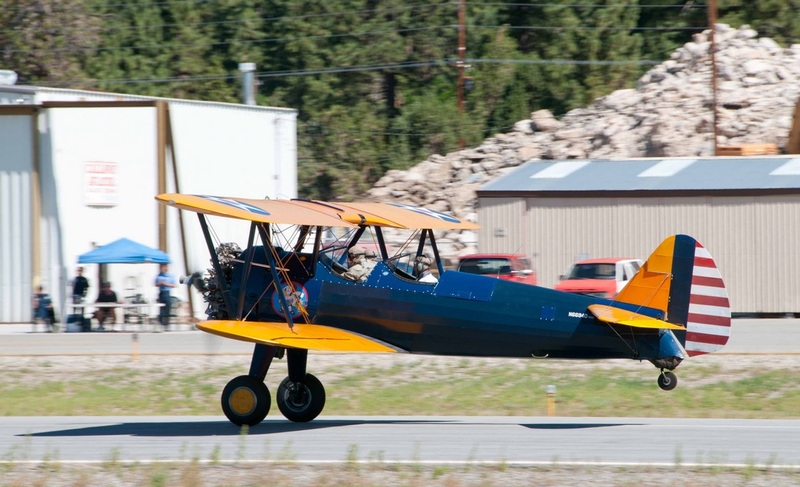 I spoke with one couple, Cathy and Tom Quintard immediately after their 15 minute Stearman flight. 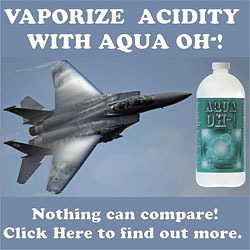 “I was scared at first but it was smoother than I thought,” said Cathy. Tom told me, “I could have done that all day.” The Quintards were one of many people who attended the air fair to experience, first hand, the joy of flying in a vintage military aircraft. 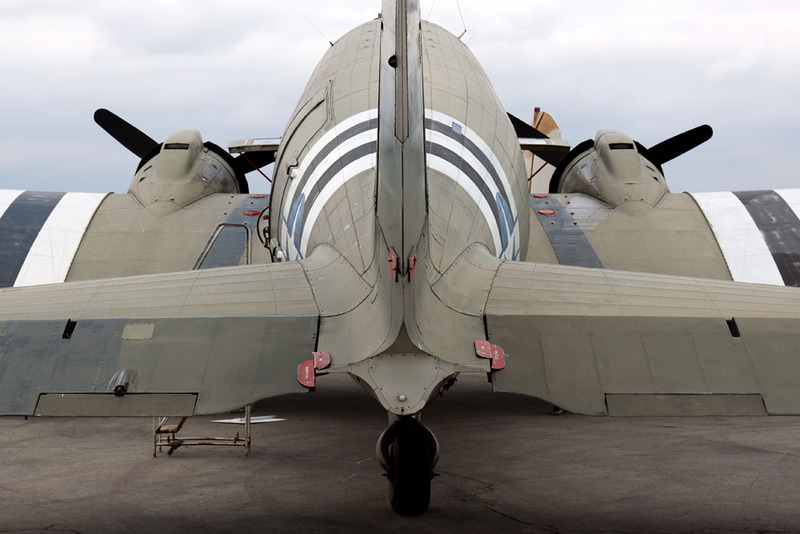 Tom and Cathy Quintard pose in the forward cockpit of a Boeing Stearman. 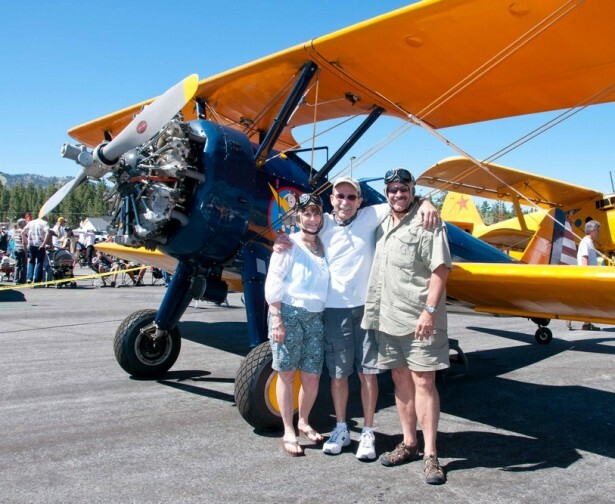 Post Stearman flight pose with their pilot Glenn Smith (center). 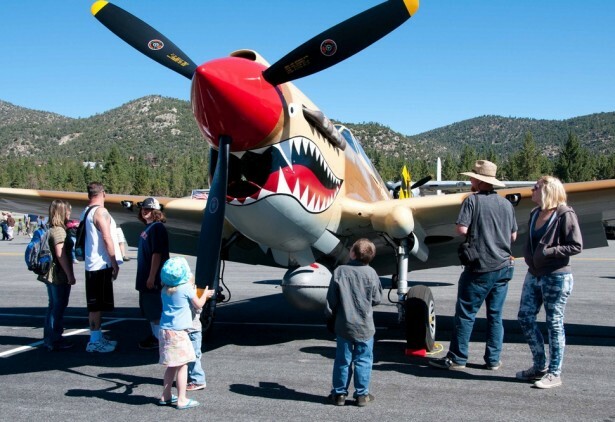 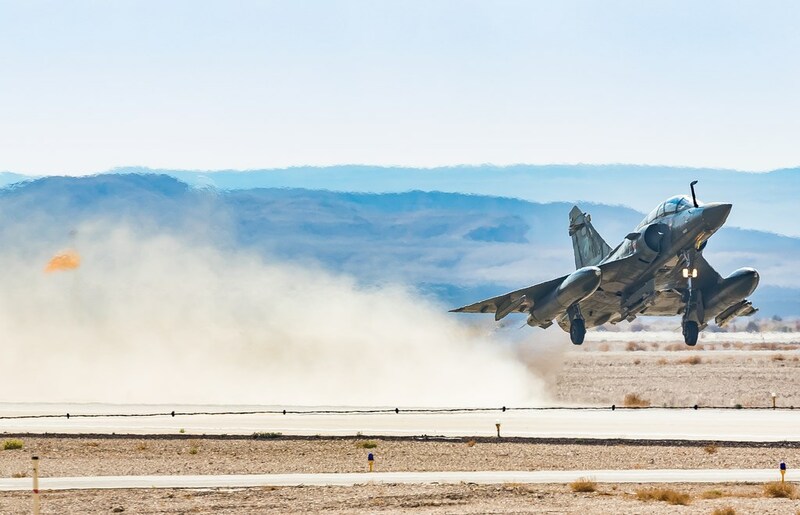 The 2011 Big Bear Air Fair was a great aviation event for the community of Big Bear and an experience that entertained, educated, and thrilled all that attended. Mark your calendars for Big Bear Air Fair 2013! 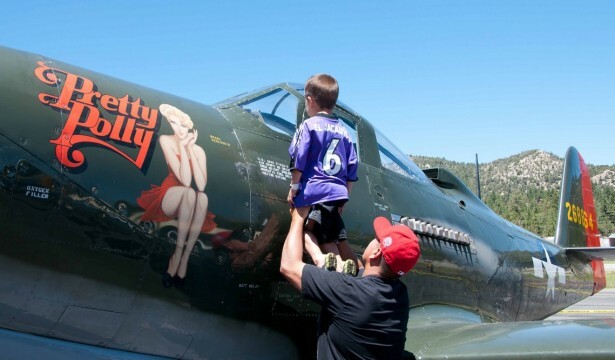 Air Fair attendees, both young and old, look over the Planes of Fame P-40 Warhawk. 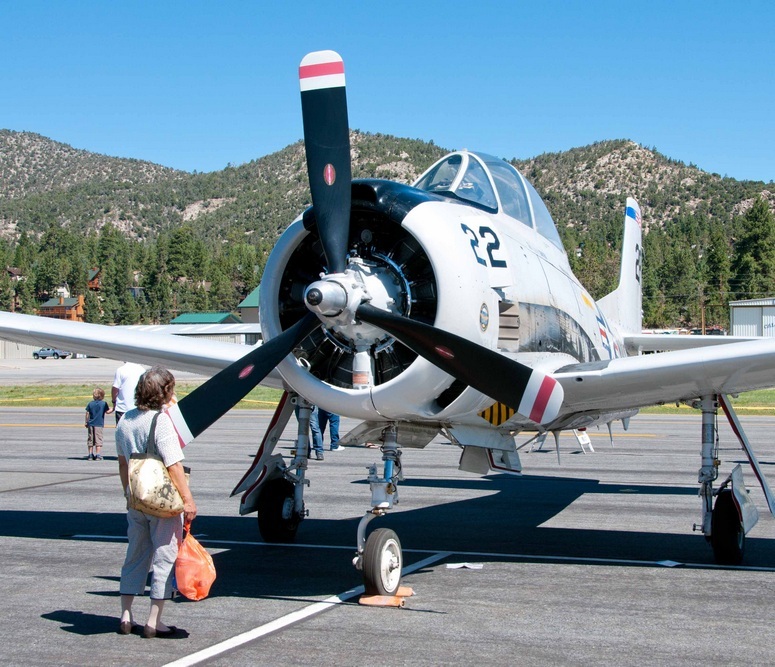 One spectator examines the huge Wright 1820 radial engine of a T-28 Trojan. 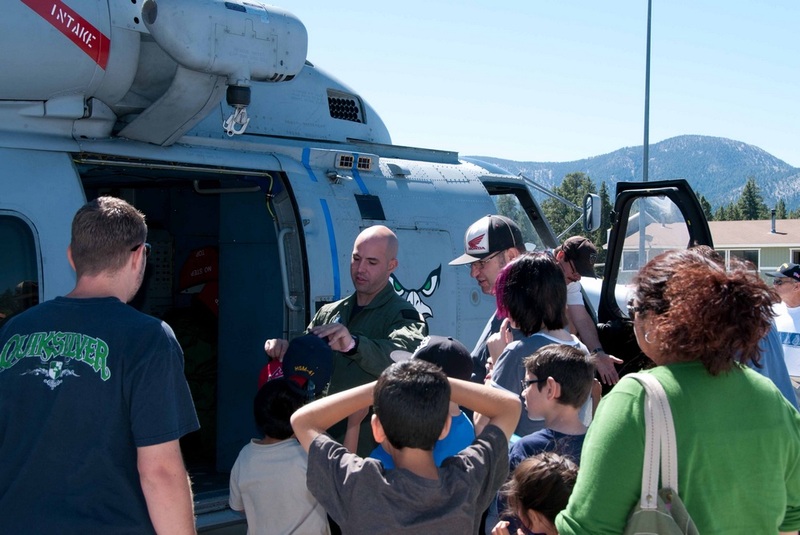 HSM-41 MM-60R crewman, AE2 (Aviation Electrician 2nd Class) Patrick Smith temporarily swaps hats with a young Angels fan. 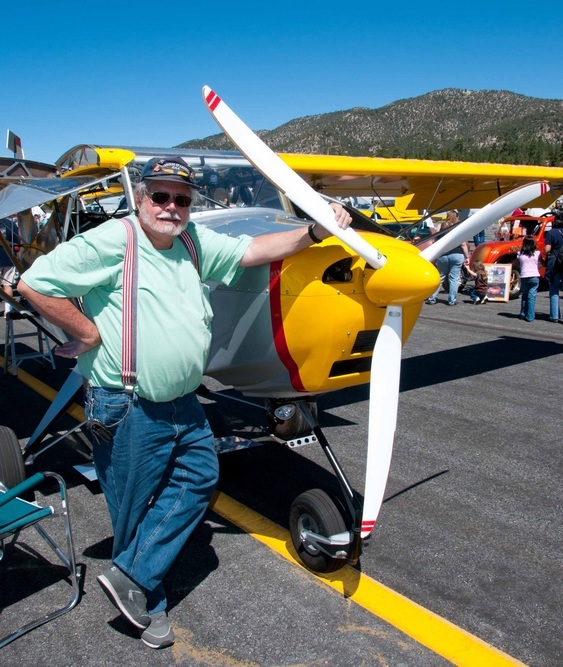 Ted Sutton from Parker, Arizona poses in front of his 2005 Just Aircraft “Highlander” kit plane. 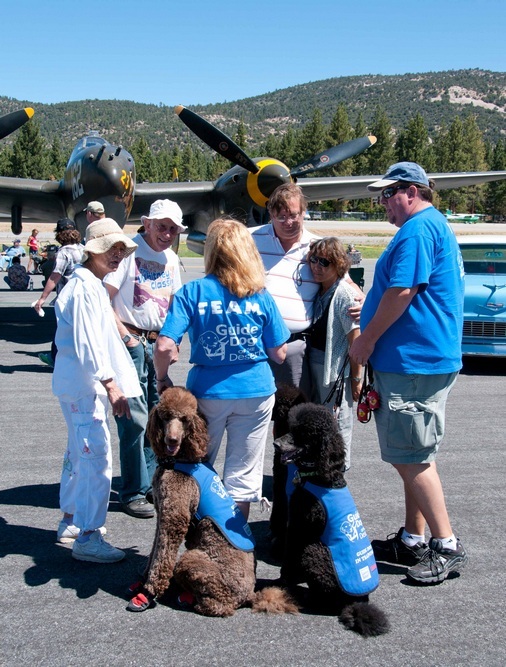 Local Guide Dog handlers used the Air Fair as an opportunity to socialize their dogs with large crowds. 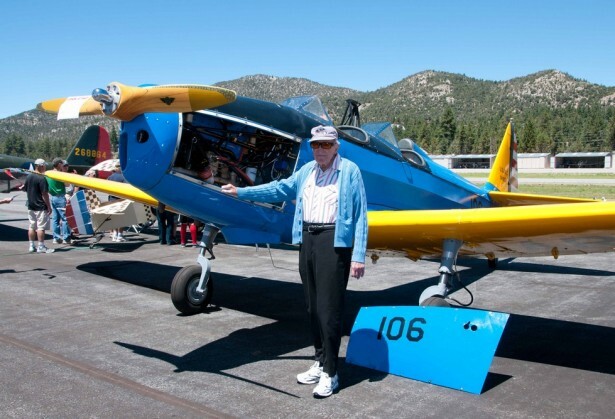 Chandler Taylor of Big Bear poses in front of a Fairchild PT-19 on display at the Air Fair. Mr. Taylor owned a PT-19 in the 1940’s and accumulated approximately 600 flying hours while he owned the aircraft. Thanks to the Big Bear Airport staff who were incredibly gracious in the access they provided and meeting the needs of the media photographers who attended. 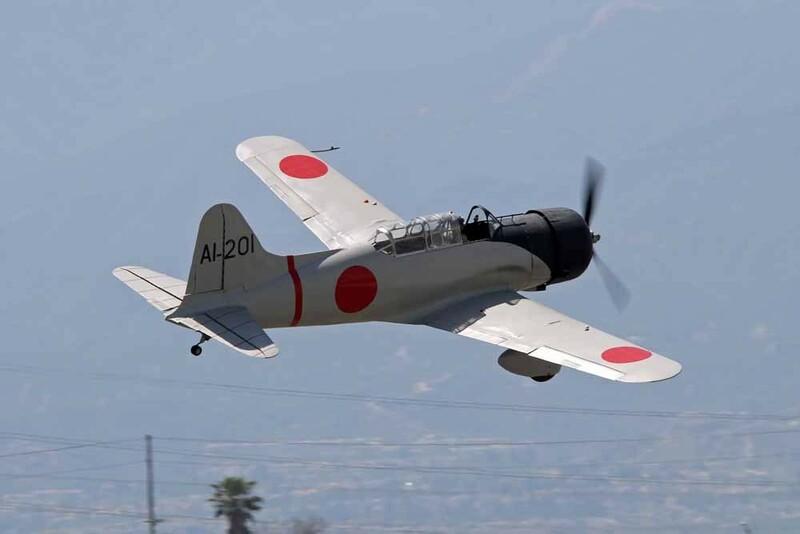 A very special thanks to Cindy Chunkdak and Pete Gwaltney for providing me added support to make this article possible and obtaining special access to various parts of the airport.